HandKrafted by Stephanie: Happy New Year! Hello friends! I'd like to wish you all a very Happy New Year! 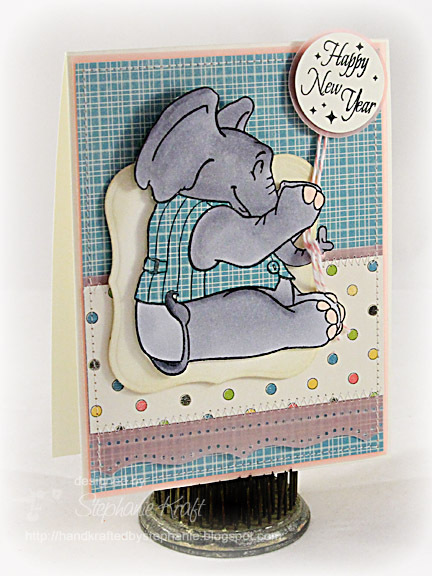 I decided to go for a slightly different take on a new year card by combining a couple of JustRite stamp sets. See that sweet little elephant? 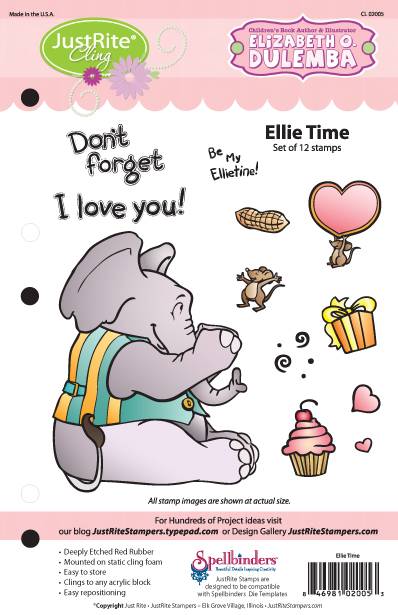 He is from the newly released JustRite cling set, Ellie Time, illustrated by children's book author and illustrator, Elizabeth O. Dulemba! I colored him with Copic markers, paper pieced his vest then I cut him out. He is popped up on a Labels One Nestability layer. He comes with an assortment of sweet images and sentiments (please see below for a look at the complete set), but I chose to pair him with another set to make a Happy New Year balloon for him to carry. I used one of the centers from Merry Little Christmas. I added a little Divine Twine as string for the balloon and wrapped the ends around his trunk. Accessories: Divine Twine, Foam tape, Thread, Sewing machine. Love this, Steph! Happy New Year!! Awww, what a sweet elephant!! Hope 2011 brings you lots of happiness! Super darling! I love the balloon idea! Happy New Year!